WELCOME TO MY MONEY MISSION ONLINE: OH STACEY!! SNOW WHITE DIAMOND EDITION DEAL!! DISNEY!! OH STACEY!! SNOW WHITE DIAMOND EDITION DEAL!! DISNEY!! I was over at my favorite blog, hip2save, and this is what I read, "I just want to give you all a heads up on this upcoming deal at Walmart! 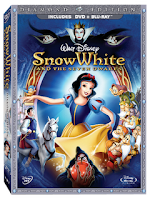 Snow White will be released for sale on October 6th! Plus, Walmart will be selling the Diamond Edition Blu-Ray & DVD Combo Pack for just $19.86." Woo-Hoo!! YES! I am taking teen daughter to the ortho dr. today, and I will be going to Big Town. And, that means a trip to WALMART! "If you are a Disney Movie Rewards member, you can try entering 786936150605 where you redeem codes and it *may* still allow you to print the coupon." I went to the disney Movie Rewards site, created a free account, entered the above code, and it worked! I also found this coupon at xpbargains. The link takes you to this site: disney videos, click on either "USA" or "Canada" and you will be able to print a $10.00 coupon. In fact, by hitting the back button, I was able to print it twice. In all, I was able to print out THREE $10.00 coupon for the above mentioned movie. I will use one for a Christmas gift, but if someone wants the other two, either leave a comment on how I can get ahold of you, or email me your info. Final cost $15 for the Snow White Diamond Edition, $5 in other Disney Princess items and a Royal baking Set! There are two rebates available on this movie, Hefty and Kernel Seasons. HEFTY: Get $5 back when you purchase one participating Hefty products and the Snow White Diamond edition. You can print the rebate form and check out the details here. KERNEL SEASONS: You can check out all the details and print the rebate form here. This is great because if you were planning on purchasing two Snow White Diamond Edition DVDs, you'll be able to do a $5 rebate for both of them! After doing both the Hefty and Kernel Seasons rebates, you'll have basically snagged two Snow White Diamond editions for just $4.99 each! Great deal! Thanks for this. I just signed up and am about to print the coupon. YAY!! I haven't tried the other two things you mention (yet!). Have a great day :). I hope it all works for you! I was reading some of the comments on Hip 2 Save, and some people are reporting a few problems "working the deal" at their local Toys R Us. for all of you who love Joyce Meyer, copy and paste the above link, and you can request a FREE wall calendar. This was on her website, on the left hand side bar, when I viewed it this A.M. It says Limited Time Offer, so you'd better hurry and get yours before it ends! Thank you for the heads up! Even though Anna is turning 18 she still loves everything Disney. Oh! You make me smile!!! Every dollar you can save is more for the pot for the kids. Thanks for the advise and I will try it..
Wohooooooo, thanks for sharing because that is one of my daughter's craze hehehe... I'll check it out..
My daughter will be very happy to have those!